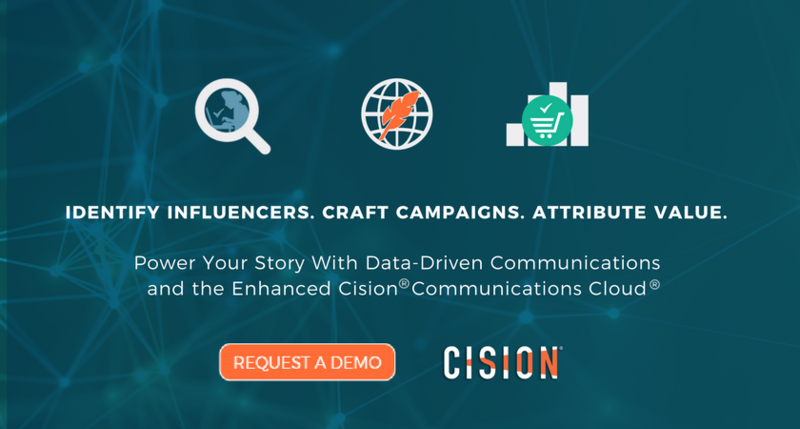 For public companies and their investor relations teams, social media can be an easy way to interact with shareholders, many of whom are on StockTwits, Twitter and LinkedIn. A 2016 Greenwich Association report found that nearly 80 percent of institutional investors regularly use social media, with most saying that posts and tweets had influenced their investing decisions. Despite those figures, many issuers do not have comprehensive social media governance policies, and many investor relations officers (IROs) are unconvinced regarding the value of these online communication platforms. 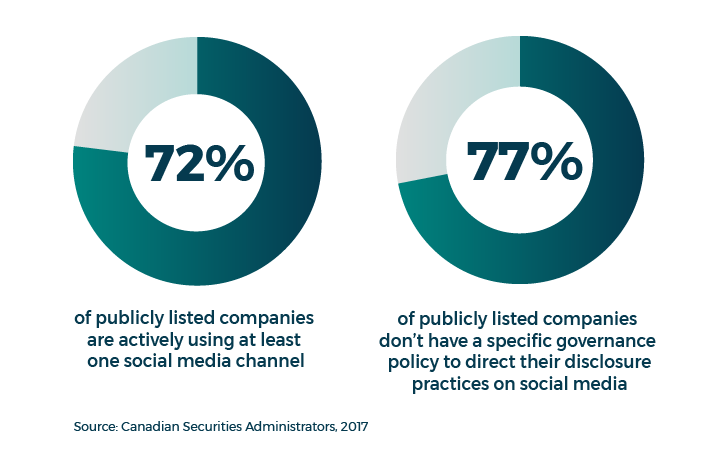 A Canadian Securities Administrators (CSA) report, released in March, found that while 72 percent of publicly listed companies are actively using at least one social media channel, 77 percent do not have a specific governance policy to direct their disclosure practices on these sites. 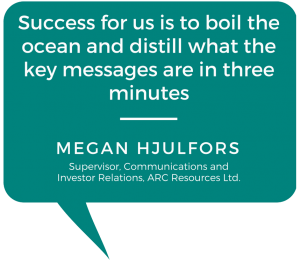 (click to tweet ) However, with social media use only increasing, and investors finding more company information online than ever, IROs are slowly working towards how best to incorporate social networking into their shareholder communications mix. With shareholders, regulators and business media all paying close attention to what public companies say, IROs are understandably cautious of a such a uncontrollable media. This white paper explores the myriad issues IROs must be mindful of when using social media, and offers suggestions on how to properly use these sites. One of the main concerns for security administrators across the North America and a worry for IROs, is improper disclosure over social media. In March 2017, the CSA issued guidance around social media use, saying that companies must report key information via a press release before reporting it on social networks. The reason is that press releases are filed on SEDAR, where every investor can see the same information at the same time. In 2013, the U.S. Securities and Exchange Commission took a different approach, allowing companies to report information via social sites first, as long as it tells investors which network will be used. 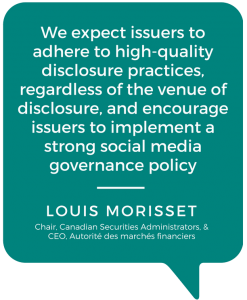 Before the CSA published its guidance, it reviewed the social media disclosure of 111 reporting issuers to see if they were complying with its national disclosure policies. The review raised some serious concerns, said Louis Morisset, CSA chair and president and CEO of the Autorité des marchés financiers, in a March press release. In Canada and the US, disclosing information that is material to a company’s operations over improper channels violates securities rules. Although Canada has a fragmented regulatory system of 13 provincial and territorial securities regulators, all make it clear that access to material information must be provided fairly to shareholders. In any case, rules must be followed, which makes it even more important to develop a solid framework around social media use. While many companies do have social media guidelines these days, it’s important that IROs either create their own documents or get themselves included in the broader policies that are usually developed by the marketing department. A policy should outline what can and can’t be posted – and include the SEC’s or the CSA’s social media guidelines so that whoever is posting knows the regulator’s rules – what sites to post on, when and where it’s appropriate to use social media, who’s responsible for posting and anything else that may come up around social media use. If information can’t fit into 140-character snippets or a Facebook post, then consider using social media to drive traffic to the company’s website, where press releases and more in-depth disclosures can be found, says Erin O’Toole, senior stakeholder relations specialist for NovaGold Resources Inc. “A goal for us is to encourage the volume of positive discussions of our company and always direct it back to our website,” she says. For instance, NovaGold uses Twitter to fix incorrect press stories that could have a material impact on its stock. In September 2016, the company’s Twitter account tweeted to the Financial Post’s account about a detail the news outlet got wrong in a story. The article had incorrectly stated that NovaGold had been upgraded from underweight to neutral, when in fact it had been upgraded from neutral to overweight, says O’Toole. The post was subsequently fixed. However, O’Toole says there have been a number of situations at her company where social media has demonstrated its worth. She points to a day nearly five years ago where the company’s share price saw a significant drop in value following the market’s misinterpretation of information surrounding one of its partners’ press releases. “Our Twitter was blowing up with all these assumptions, and we put out a very quick tweet recognizing the issue and saying a press release is coming out soon,” she says. From a monetary standpoint, it can be difficult to place a value on the benefits of social media, but it’s clear that there are tangible advantages to the platform, from countering negative news to highlighting positive information.